San Juan Chamula in Chiapas, Mexico, is somewhere I’ll never forget. My senses overpowered me and the tears flowed at this Tzotzil Maya village near San Cristóbal de las Casas. Here’s why. The view of the main square itself was enough to get my senses reeling. A colourful swirl of vegetables and unrefrigerated meat for sale, providing an assault on the eyes and nostrils. I made my way through the sellers and stepped inside San Juan Chamula’s church. The scent of pine needles struck me. They looked to be an inch thick, all over the church floor. The effergies of the Catholic saints surrounded the dusky interior, but the offerings to them were where Mayan culture was visibly alive. Small groups gathered on the floor of the dusky interior, each led by a spiritual leader, a shaman. Villagers in San Juan Chamula seek out a shaman to help them carry out a ritual to expel illnesses. Candle burning aids the process – physical and mental illnesses to be expelled are represented by different colour candles. White candles signifying a general ritual. The candlelight flickered amidst the pine needles, and caught movements in the glum light. Prayers were chanted, eggs broken, animal bones rubbed, and – occasionally – there were the muted sound of a chicken being sacrificed. Fizzy drinks consumed – it’s believed the induced burping from helps to expel the illness. The holders of the Coca Cola and Pepsi franchises here are rich. Emotion hit me like a wave. My brain couldn’t process what I was seeing – this fusing of beliefs displayed in one place – and my eyes welled up. I was glad for the dark to hide the glistening of my tears. The ceremony concluded with the consumption of the local firewater, known as posh. In some cases it’s how shaman are paid for their services, and my guide told me alcoholism is an issue in the village. The church and its sheer other-worldliness may have been the most emotional part of my visit to San Juan Chamula, but it certainly wasn’t the end of what I learnt about the village. I was told that men have the right to more than one wife and the right to vote – which they do by raising the hat that forms part of their traditional dress. Women don’t wear these hats. No hat = no vote. 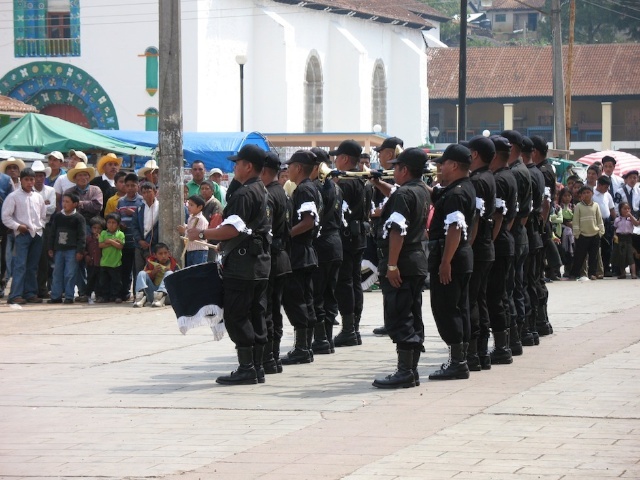 The San Juan Chamula village government has its own police force, which deals with minor crimes through community service punishments. Major crimes are handed over to the federal police. Taking close-up photographs of villagers is classed as a minor crime, and visitors will have their photos forcibly deleted if they try and break the rule. My view? Not having photos has made the whole overwhelming experience live longer in my memory. If you’re looking to push your culture comfort zone, I’d highly recommend a guided tour to San Juan Chamula and other villages near San Cristóbal de las Casas. Where have you been that’s moved you to tears? Share your experiences by leaving a comment below.